If you haven’t visited our website, KatahdinCedarLogHomes.com, recently, you’ll want to check out the new “How-To” pages we launched in the past few weeks. Even if you’ve built a home before, log homes provide some special challenges. Additionally, many Katahdin Cedar Log Homes are built outside of traditional subdivisions on rural and undeveloped property, which can pose their own considerations. What really happens when you build a log home? We realized that there were no comprehensive sources for this information. So we decided to consult with our log home building experts around the country and right here in Oakfield to try and cover some of the basics about building your log home. 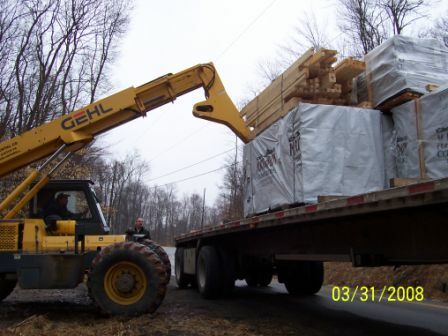 We like to have our customers actively involved in the excitement and want to ensure that you will understand the elements that go into a log home building project. We also made these pages easy-to-download pdfs so that you can take them with you to key meetings with your real estate broker, your dealer, you builder, code officials, and contractors. With these “How-to” pages you can navigate the process from undeveloped land, site preparation, wells and septic systems, foundations, insulation, green initiatives. We’ve develop a list of the steps you’ll follow when sketching designing and approving your log home plans, and what happens when your log home kit arrives on-site. We’ll continue to add and update information on our website to keep you better informed about the log home lifestyle. We encourage you to visit katahdincedarlogohmes.com regularly to catch up on new developments!